The long-awaited investment in the Rosemary District has happened, with at least four residential projects under construction. Will improvements to the public realm follow? At 5:30 p.m. Tuesday, the building at 1421 Fifth St. was packed with dozens of people, many of them younger professionals, chatting and sipping wine and beer from the bar. The crowd was not assembled at a bar for happy hour, but rather at the design and sales office for Risdon on 5th, a 28-unit condominium scheduled for completion next year. The scene highlighted the growing interest in the rapidly redeveloping Rosemary District, a neighborhood slated for more than 10 new projects by 2018. 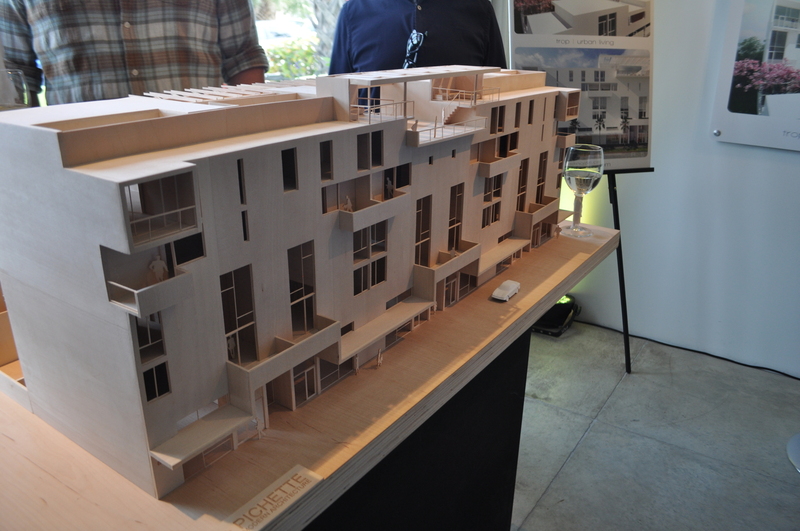 The crowded gathering to celebrate Risdon’s work in the Rosemary District featured a model of the Risdon on 5th project, slated for completion next year. 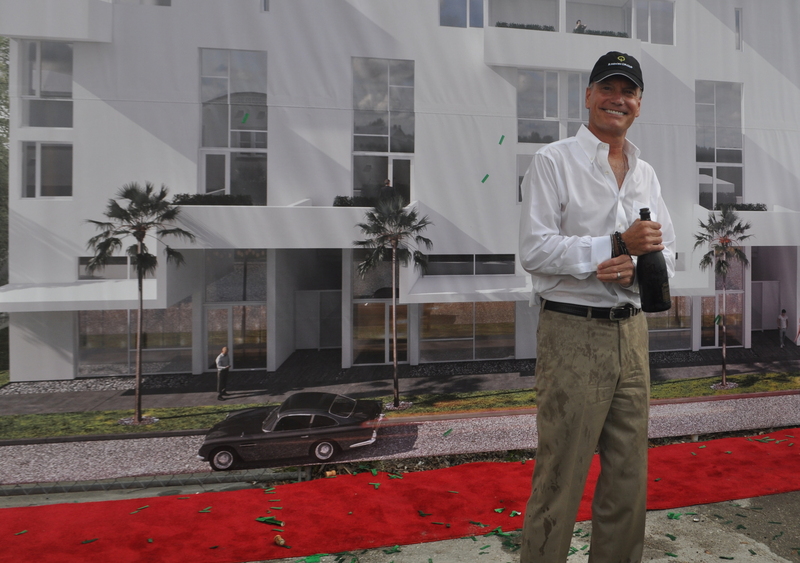 The event, a groundbreaking for the condo project and a celebration of a second Risdon development in the area, was everything longstanding advocates for the neighborhood could have envisioned a decade ago. Throughout the room, attendees were buzzing about the imminent future of a district that’s struggled to attract new private investment. At this point, conversations about the revitalization of the Rosemary District can start to exit the hypothetical phase. The investments have been made; the buildings are starting to come out of the ground. More than 1,000 residential units will be added to the neighborhood over the next two years. As a result, the conversation surrounding the Rosemary District has started to shift. The people who are investing in the future of the district — as well as those who have been there for years already — want to make sure the private growth doesn’t just occur in silos. How, then, can the fabric of a legitimate mixed-use neighborhood begin to come together? Property and business owners — including Steve Bradley, president of the Risdon Group — are meeting monthly as a subcommittee of the Rosemary District Neighborhood Association in an effort to answer that question. Eventually, the goal is to organize the community’s priorities and work collaboratively with public officials to try to address them. Led by property owner Howard Davis, these meetings evolved from an effort to expand the self-taxing Downtown Improvement District to the Rosemary District. Although some developers said it was too early to commit to that type of investment, the conversation about using private money to help improve the public realm was just getting started. Steve Bradley is one of several Rosemary District stakeholders actively assessing the future needs of the neighborhood. “It brought closure to the expansion of the DID within the Rosemary District, but it didn’t say that need goes away,” said Michael Bush, owner of Home Resource and president of the Rosemary District Neighborhood Association. To those taking an active role in this conversation, the time to act is right now. Residents haven’t moved in yet, but it’s possible to forecast some of the top priorities that will pop up once they do. Where is the neighborhood’s park space? How will parking be managed with all the new residents? What should the streetscapes look like, and how will the connectivity to downtown be improved? By articulating a clearly defined vision for the Rosemary District, the stakeholders hope they can begin to seriously address questions like those while enthusiasm for the neighborhood is still trending upward.